Home » Product review » Shiny Nails in an Instant! For girls like me, much of our time is spent on taking care of our looks. Lately, though, I have been super busy, so I can’t go to a salon each time I want to have my nails done. Weekends are especially a busy time for nail therapists, and I just don’t have the luxury to wait for someone to confirm my appointment. Fortunately, I have a vanity kit chock-full of nail clippers, polish, and other stuff at home. I can keep my nails clean and well-polished with the same level of quality that nail salons provide, if not better. I often use the G-shiner I ordered from MetroDeal, which lets me keep the shine on my nails for weeks! 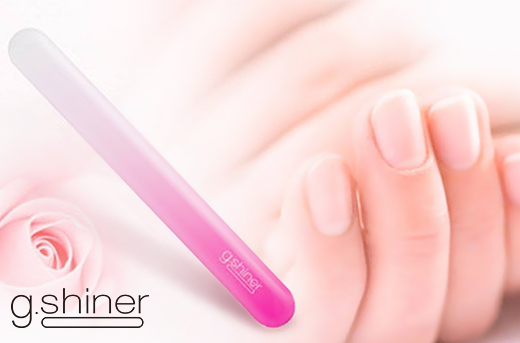 An authentic Japanese product, the G-shiner uses a tempered glass treatment to add glitter to my polished nails. I simply stroke the rough surface of the G-shiner directly on my nails, and just like magic, my nails look as pretty as can be!